“What do you do with the bad product?” I asked. “Well, we can’t sell it and we can’t melt it down, so we throw it away,” replied Donna. This entry was posted in Control Systems, Systems and tagged control systems, quality control on July 23, 2018 by Tom Foster. “You cut your lead time from six weeks to four weeks. Higher throughput with the same number of people, with the same equipment, in the same facility, you lowered your cost. You shifted from just getting the orders out the door, to a consistent, predictable system. And that’s when your troubles began?” I was curious. “Pace and quality,” I said softly. “So, finally you got organized, accelerated your throughput, beat your internal quality standards. It must have been a proud moment,” I encouraged. 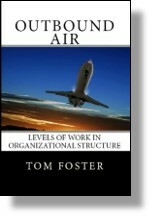 This entry was posted in Organization Structure, Performance Feedback and tagged feedback loops, quality, quality control, system, warranty on July 31, 2012 by Tom Foster.